Slowly but surely we’re being told that the NFL and NFLPA are inching towards an agreement concerning the renewal of the collective bargaining agreement . What I find completely unbelievable about this whole episode is the very fact that the league and union have said little about they will do to meet the needs of the retired veteran players around of NFL. At no time during these deliberations have I heard or has it been reported as to what the NFL’s intentions are concerning to meet that of the players in question. I will continue to maintain that the NFL much like the union which says they represent all of their members simply do not care about the players in question. Hall of Famer — Carl Eller and a number of his peers have filed a civil suit in Federal Court challenging the NFL and concerning the ongoing negotiations and the mere fact that little if any input has been allowed to be interceded in what might well be a binding agreement as it relates to the collective bargaining agreement. Much of what has now transpired now seems like a comedy of errors that couldn’t have been scripted by a Hollywood writer had it been first brought up as a premise . Roger Goodell and his minions have been given a considerable dose of reality , as too have DeMaurice Smith and the executive members of the NFLPA . I am no longer enthralled as to whether or not there will be a regular season as the NFL has lost my complete and utter respect ! The asinine behavior by all of the parties concerned has me now simply wondering what else is there left for the league to do to leave its image in tatters ? Well now that the season has resumed after the All Star Game , an event which in all honesty was about as mesmerizing as a political debate between two candidates who are about as insightful on the issues as they allegedly believe themselves to be. The game itself , with what was said to be at stake and you have to wonder why it was that the effort from the AL was so lackluster ? I can only imagine that their reason for participating was merely obtain their roster incentives from their respective teams . After that mediocre display by the team it simply served notice that the players are not in the least bit concerned with what the fans may well have thought . Infielder Sean Rodriguez (1) of the Tampa Bay Rays tries to turn a double play as Brett Gardner (11) of the New York Yankees breaks it up during the game at Tropicana Field on July 18, 2011 in St. Petersburg, Florida. Photo by J. Meric/Getty Images ……..
Now a number of patrons and contributors within this medium have suggested a number of ways to improve the event . And while many of the suggestions are valid I believe that what is actually needed is for there to be more of an input from the managers around the league and actually less from the fans in terms of the voting for the ballots of the All Star teams ! That being said after the low ratings for the televised broadcast on Fox I can’t help but wonder how Bud Selig and the league hierarchy now might view this rather disastrous event that is often seen as one of the major highlights of the MLB season. Rumor has it , that next season in staging the All Star Game at Kauffman Stadium , home to the Kansas City Royals rather than stage a game of the league’s current stars they will consider the staging of a soft ball game between the wives of the players who’ll be scantly clad . Perhaps that might incite and elicit even more viewers than the benign ratings obtained by Fox and the MLB Network . Baseball has become bereft of creativity and ideas that now even with the team owners showing their stupidity and a union that has been enabled because of the sheer ineptitude of the league hierarchy. The game is losing is fans simply because the top executives within the game no longer considers what made baseball all the more appealing , instead they look to cater to one common denominator and that is to their corporate sponsors rather than to the fans . In what might be considered a series that very well defines their season the Tampa Bay Rays are hosting the New York Yankees . Given the tightness of the race within AL East where six games separate the top three teams within the division . It is imperative that the Rays get a win under their belt in the opener , in order to place further pressure on the Boston Red Sox and Yankees who sit ahead of them within AL East. For all sense and purpose most definitely the wildcard entrant the AL will come from within the division , so there is a great deal at stake for both teams as to the outcome of this series . Joe Maddon as manager of this team along with his coaching staff know that they will have to be at their very best over the ensuing months . Much has been made concerning the team as of late and whether or not Andrew Friedman the team’s general manager will be a major player as the trade deadline approaches on the 31st July . The are now rumors now resonating through the grapevine that would suggest that there’s something in the offing and that in all probability a player on the team’s current roster will be traded . All signs point to the fact that BJ Upton whose contract expires at the end of this season could very well be the player in question to be off-loaded . Now it goes without saying that the player is a desirable target for a number of teams seeking an offensive presence to add some potency to their lineups to their respective rosters. And as with any team now looking to off-load salary it now seems as if the dye has been cast by the front office as the financial constraints placed on the organization has been stifling the competitiveness of this team. I don’t know that the front office can continue in the apparent direction that it seems to be heading in much longer , merely because of the fact no matter how many steps forward they seem to be taking , they tend to take even more steps backwards . I certainly don’t believe that principal managing partner Stuart Sternberg actually believes that the team will be aided by the league hierarchy be providing any assistance to the organization as they seek a new venue. A great deal has been chronicled on this matter and it goes without saying that the longer this issue remains unresolved the more protracted it will somehow become . Over a long an arduous season a great deal is expected of team over the course of the year . 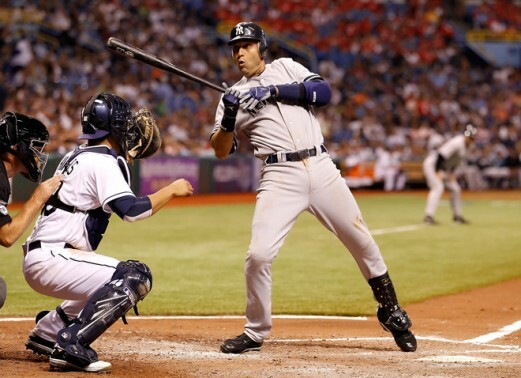 It will certainly be no different for the Tampa Bay Rays and many of the other teams seeking to make the postseason . Certainly the races around a number of the divisions are now heating up and though I have heard it said that a 5 or 8 game margin isn’t a great deal to overcome but it is something of a rarity to see such a deficit be erased over the closing months of the season . 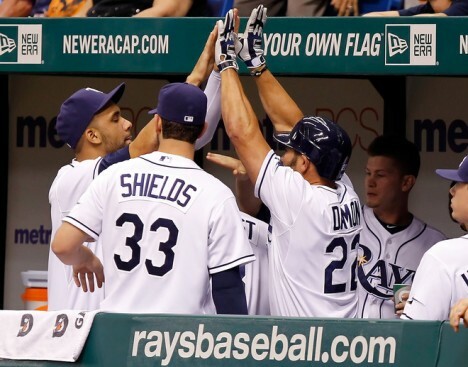 Designated hitter Johnny Damon (22) of the Tampa Bay Rays is congratulated by pitchers James Shields (33) and David Price (14) after scoring a run against the New York Yankees during the game at Tropicana Field on July 18, 2011 in St. Petersburg, Florida. Photo by J. Meric/Getty Images …. From my own perspective as it concerns the Tampa Bay Rays , this is a team that is full of youthful vibrance looking to excel at the highest level and that is epitomized by players such as Evan Longoria , James Shields , David Price , Sam Fulds , Matt Joyce and others on this roster . They have an excellent manager in Joe Maddon whose coaching staff seems to excel in bringing out the best in young players and in getting seasoned veterans such as Johnny Damon to play as if their careers are on the rise once again. Damon if anything has been a leader of this team in more ways than one , willing to impart his considerable knowledge amongst his teammates in order to make them better. 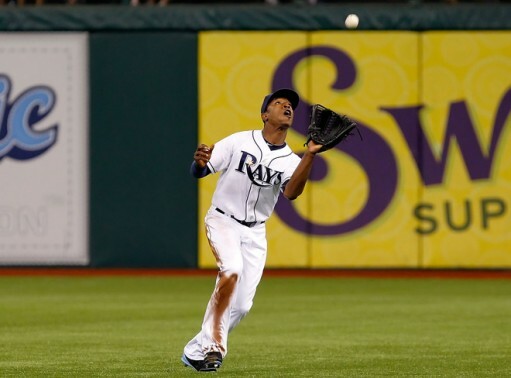 And much of that has been on display throughout the season as the Tampa Bay Rays have played with a great deal of zeal as they look to make themselves known within the division. What is undeniable given the effort of this organization is that they will do their utmost to exhibit everything needed to fulfill the wishes of their fans . But slowly the inevitable does appear to be happening and it is that some of them now are willing to accept that this may well be the closing chapters of a saga that is coming to an end . The optimists out there simply believe that the best thing that can happen is for the team to simply move across the bay into the downtown area of Tampa and all will be OK. The reality however , suggests that in light of economic climate even such a proposed move is by no way a real guarantee of financial success for this organization. Also , bear in mind that the league hierarchy under Bud Selig has done little to aid the team in its efforts as they seek to resolve the ongoing issue of a new facility. As I alluded to earlier , the league is simply bereft of ideas on all fronts , from its image , to how best to aid its teams that are now said to be having numerous financial difficulties and to where the fans are beginning to have an immense distrust of the hierarchy and owners. In what might have been a truly damning indictment as to the problems that the Tampa Bay Rays now face as to the plight of their situation , during last night’s game there was a prolonged stoppage. The game was halted due to the fact that there was a electrical problem that caused an outage where a number of the stadium lights went out at Tropicana Field . As archaic as the venue appears to be fans of the Rays simply feel that this is the team’s home and where they belong. However , the on air analysts covering the game for ESPN , John Kruk and Barry Larkin likened the venue to a gaping pothole that never ceases to cause problems . Both alluded to the fact that a number of players around the league simply dislike playing at the field and each throughout the course of their careers would simply wish they were playing elsewhere rather than being at Tropicana Field . Joe Maddon when questioned by Tim Kurkjian about the issue of the lights going out during at the game told the reporter that this was merely one of the things that they continue to put up with and that this was simply a way of life for this organization. At the game’s resumption you couldn’t help but wonder what other comedy of errors would now await the fans in attendance , never mind the national television audience watching. With the MLB season having resumed how do you see things panning out for the teams within the AL East ? And what thoughts if any do you have as to the future of the Tampa Bay Rays long and short terms , as it relates to their competitiveness and whether or not they remain within their current locale ? Simply leave a comment as you deem fit . (1) FILE – This April 14, 2011 file photo shows retired Minnesota Vikings Hall of Fame football player Carl Eller, who represents former players, arriving at the federal courthouse in Minneapolis. Eller and lawyers for retired NFL players joined labor talks with representatives of owners and current players, Tuesday, July 19, 2011 in New York, as signs mounted that the league’s lockout might almost be over. AP Photo/Jim Mone …. (2) NFL Players Association spokesman George Atallah, right, pauses as he speaks to media in Washington, Monday, July 18, 2011, as talks to end the NFL lockout continued. Carl Francis also with the NFL Players Association is at left. AP Photo/Carolyn Kaster …. (3) NFL player Association executive director DeMaurice Smith along with NFL Payers Association president Kevin Mawae, left, speaks to reporters outside a law firm where contract talks ended, Friday, July 15, 2011, in New York. Significant progress on a major sticking point in the NFL labor impasse soaring rookie salaries during marathon talks Thursday raised hopes that a tentative agreement in principle could perhaps come within 24 hours, according to two people familiar with the negotiations. AP Photo/Louis Lanzano …. (7) Infielder Sean Rodriguez (1) of the Tampa Bay Rays tries to turn a double play as Brett Gardner (11) of the New York Yankees breaks it up during the game at Tropicana Field on July 18, 2011 in St. Petersburg, Florida. Photo by J. Meric/Getty Images ……..
(8) Infielder Casey Kotchman (11) of the Tampa Bay Rays takes the throw at first as Curtis Granderson (14) of the New York Yankees gets back safely during the game at Tropicana Field on July 18, 2011 in St. Petersburg, Florida. Photo by J. Meric/Getty Images …..
(10) Designated hitter Johnny Damon (22) of the Tampa Bay Rays is congratulated by pitchers James Shields (33) and David Price (14) after scoring a run against the New York Yankees during the game at Tropicana Field on July 18, 2011 in St. Petersburg, Florida. Photo by J. Meric/Getty Images ….